Atmospheric Lens is a public artwork integrated into the dome of the Vaughan Metropolitan Centre Transit Station in Toronto. 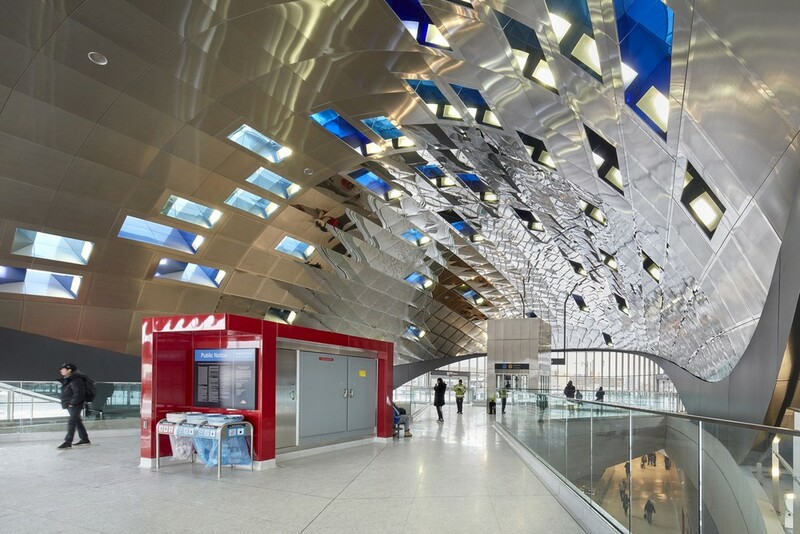 Spanning 16,000 sqft it dissolves the convex ceiling of the above-ground pavilion into a dynamic, cubist collage of reflections of life inside the station. 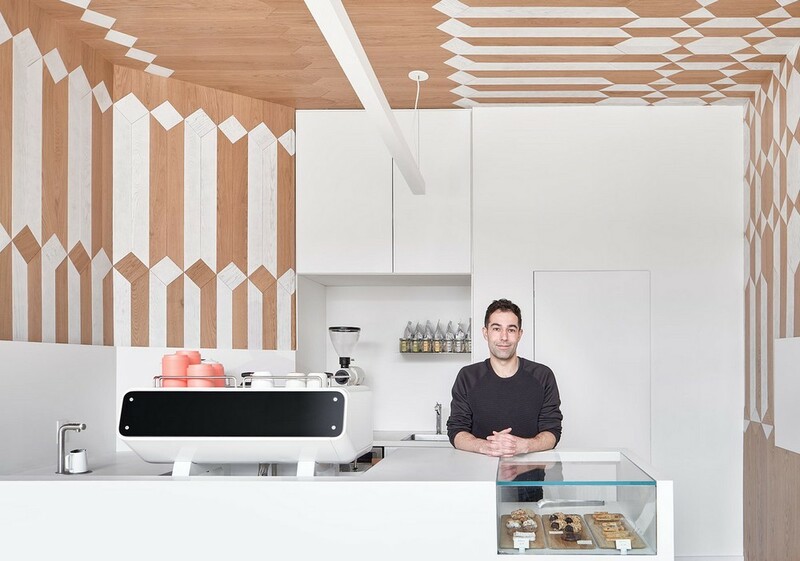 Evoking frothed milk in a latte: the concept of ‘everything surrounding the offering being as important as the product’ has helped shape the concept of Milky’s. The 65,000-sqft, $37m project is one of the first in Canada for a municipal client using the Integrated Project Delivery (IPD) model. 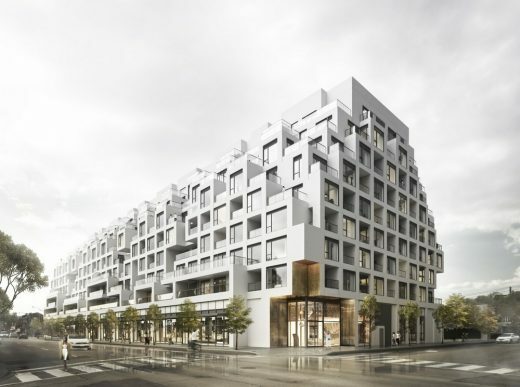 This new nine-storey boutique mid-rise condominium features a contemporary, all-white façade and terraces that provide sweeping views of the neighbourhood. An artificial hillside is created by sloping the south side of the building facing Dupont St. 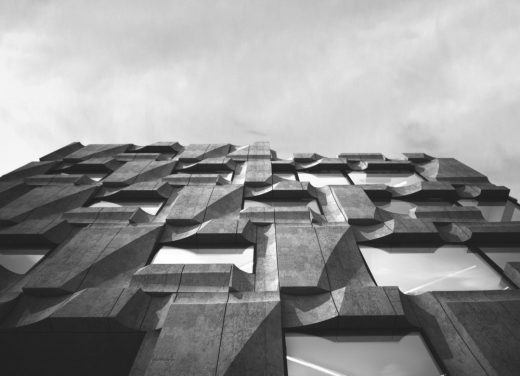 In 2009, the University of Toronto’s Daniels Faculty of Architecture, Landscape and Design (DFALD) launched a competition to transform their existing building into a framework more relevant to their teachings and aspirations. The first new student residence to rise at UoT’s downtown St. George campus in a decade has reached a development milestone. Toronto’s largest circulating library re-opens today after a major renovation project. Diamond Schmitt Architects has revitalized the North York Central Library and reprogrammed space to support the delivery of new services to meet the changing needs and expectations of its users. Based on artifacts from the Royal Ontario Museum and the Gardiner Museum, which are directly above the station, these iconic symbols of Canada’s First Nations, Ancient Egypt, China’s traditional culture, Mexico’s Toltec culture and Ancient Greece also represent load-bearing artifacts from their era. 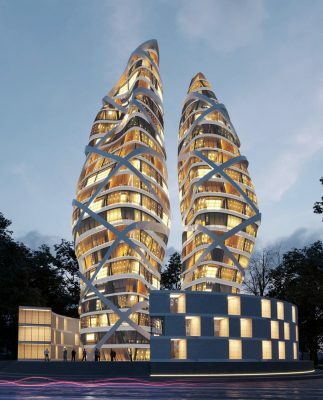 Designs for Foster + Partners newest residential project in Canada has been revealed in Toronto. 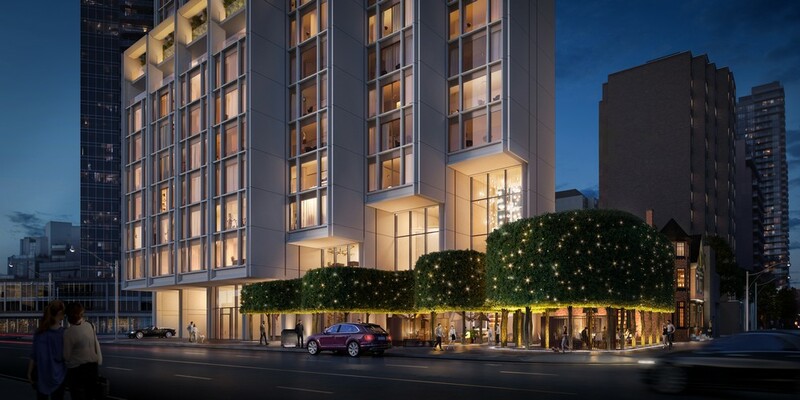 A unique amalgam of community-based amenities, heritage restoration, high-end luxury residences, and public green space, 50 Scollard lays the foundation for a rich social anchor within a vibrant district in downtown Toronto. The design strategy focused on an idea of “organized collision”: fostering collaboration by artfully combining dynamic physical and visual interconnectivity with a variety of ideal work environments – from quiet spaces for private contemplation and mathematical calculations, to blackboard nooks in circulation space, comfortable dedicated interaction areas, and formal presentation rooms. 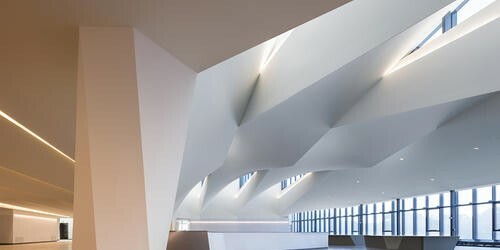 The Metropolitan Toronto Central YMCA, designed by Diamond Schmitt Architects, is this year’s recipient of the Prix du XXe siècle, an award that recognizes outstanding contribution to Canadian architecture of 20th century design. Hariri Pontarini Architects is honoured to announce that Casey House has been awarded the Governor General’s Medal in Architecture by the Royal Architectural Institute of Canada (RAIC). 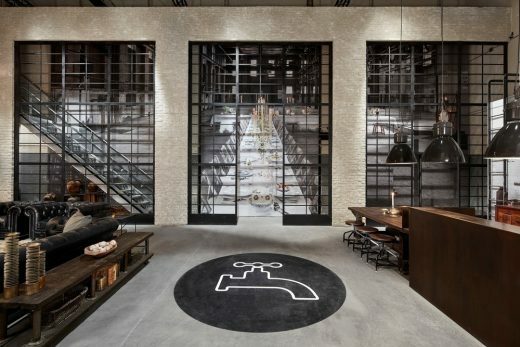 A recent winner at the World Interior News Awards, Cecconi Simone Inc.’s presentation centre for Waterworks – a mixed-use condominium project in downtown Toronto – offered a fleeting glimpse of beauty and a preview of what’s to come. 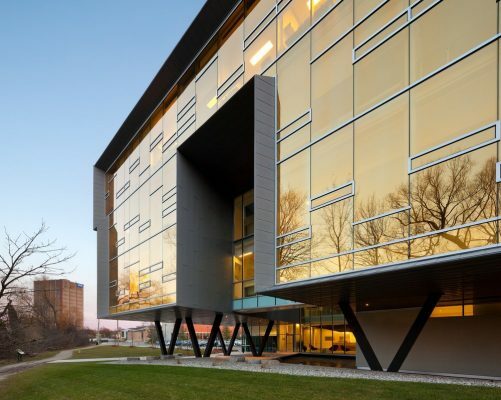 This building has won the Office Development of the Year Award for the Greater Toronto Area. 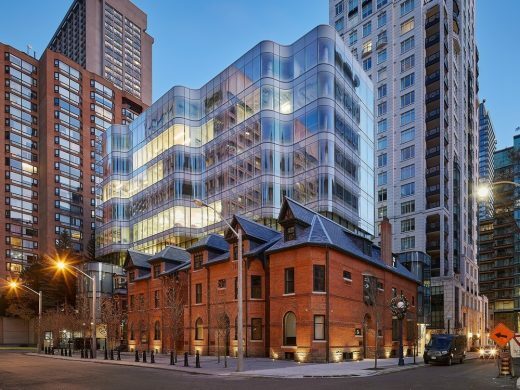 The Commercial Real Estate Development Association Greater Toronto Chapter (NAIOP) presented The Globe and Mail Centre, its architects and developers First Gulf Corporation and OPTrust and Colliers International with the REX Award for 2018. The architect takes the notion of love and shoots it up into the sky. 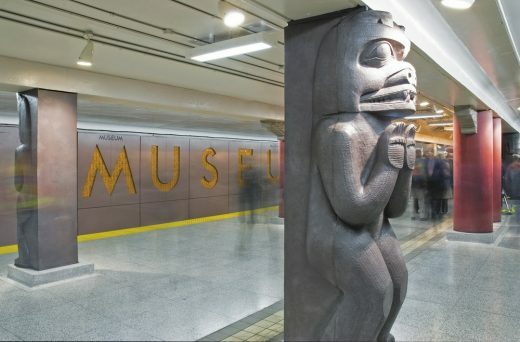 His design allows onlookers to pause to apprehend the mystery; allowing visitors to walk its hallways and through its corridors. 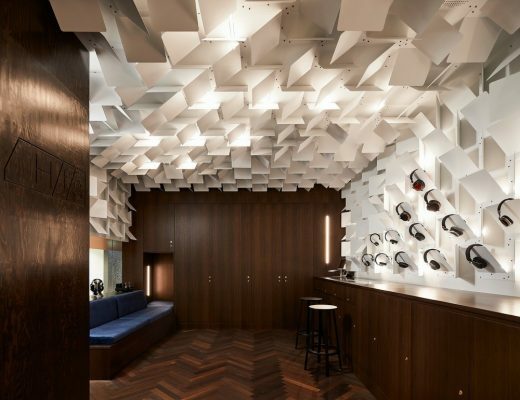 A 300 sqft retail fit-out for high-end headphones, earphones, amps and audio accessories. The store interior is on the main floor of a 42-story mixed use tower with direct subway access to Toronto’s Yonge and Sheppard station. HMC2 opened in January 2017 as the second building on Sheridan’s newest campus. 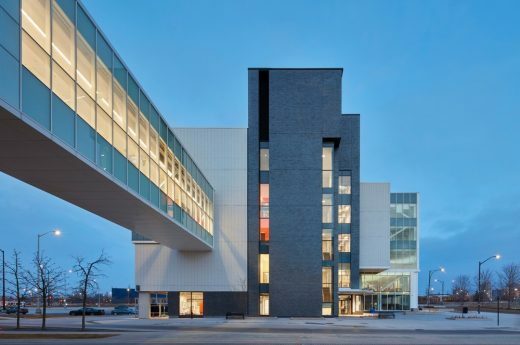 Accommodating an additional 3200 full-time students, the new buildings combine state-of-the-art formal and informal learning spaces to become an incubator for invention and applied creativity. Architectural interest is found in the complex sectional character of the building. 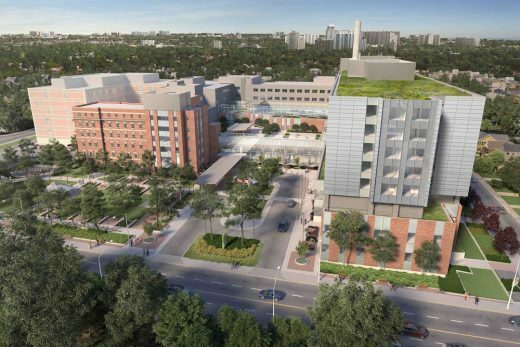 February 6, 2018, Toronto – Michael Garron Hospital and Infrastructure Ontario have selected a design-build-finance team including leading Canadian design firm Diamond Schmitt Architects for a transformative campus redevelopment and state-of-the-art patient care tower. 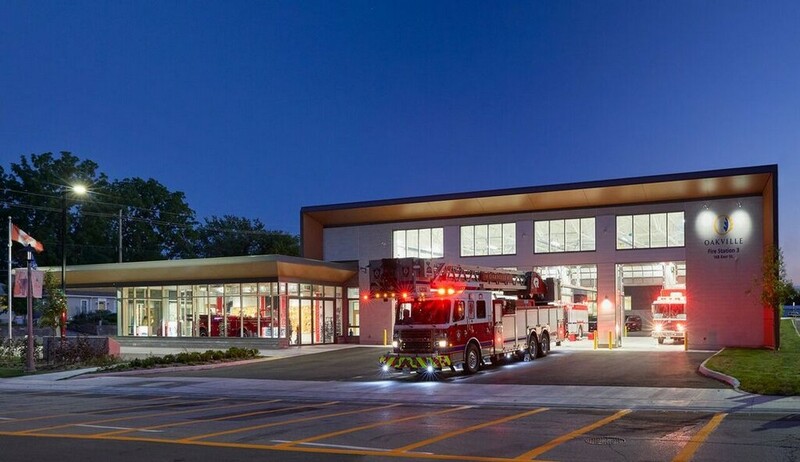 The EllisDon Infrastructure Healthcare team is comprised of EllisDon Design Build Inc., Diamond Schmitt Architects and B+H Architects in joint venture, and EllisDon Capital Inc. 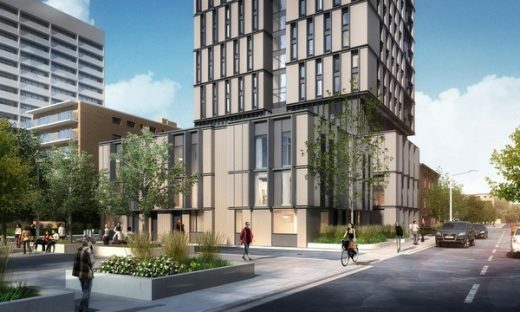 The project is centered on a new eight-story patient care tower and three-story podium designed to bring a light-filled, modern patient experience to the Toronto healthcare facility. The design also serves to connect with the community in support of the hospital’s vision to become a health promotion partner and amenity for the neighbourhood. “The design extends the public realm through a seamless transition into public spaces with improved wayfinding around a large daylit lobby and consolidated ambulatory care services,” said Matthew Smith, Principal, Diamond Schmitt Architects. Full glazing on the double-height lobby extends across the podium of the patient tower providing views and visual connection with a new landscaped park that replaces some of the oldest buildings on the campus. Patients and staff will also have access to roof terraces. The project will add approximately 550,000 square feet of new space and renovate an additional 100,000 square feet of the existing hospital. The contract is valued at $411 million. Groundbreak for the LEED Silver redevelopment will take place in April. 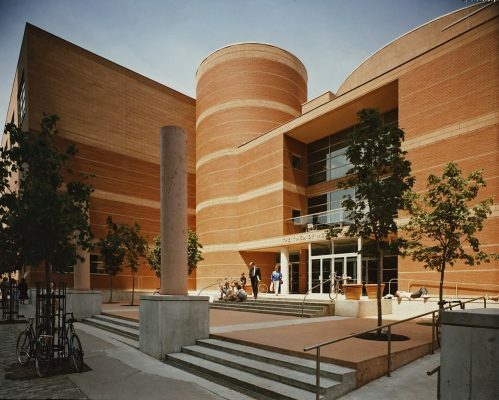 Design: Montgomery Sisam Architects Inc.
A building that provides students with the amenities of a campus within the constraints of a confined urban site. 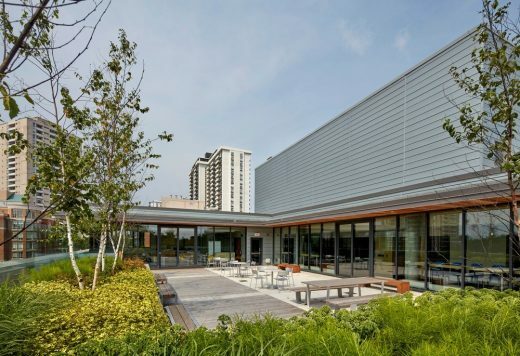 Designed by Montgomery Sisam Architects Inc., the Greenwood College School Expansion is a 74,0002 -building addition located in mid-town Toronto. The dense, four-storey structure adjoins the existing school at every level above grade, increasing the School’s square footage by 120%. Making efficient use of limited land, it features a balanced mix of work spaces and social space that supports a personalized, new-century approach to learning. This building harmonizes retail and commercial design through an inventive interplay of form and light, blending Victorian and contemporary materials to create a unified work. 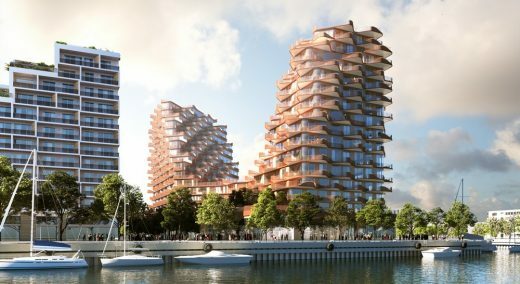 3XN wins competition to design waterfront condo that honours the waves. Tridel and Hines have commissioned 3XN to design a building on the formerly industrial East Bayfront area. The project has just been through the second design review panel and is expected to start construction by the end of 2018. Design for the over 4 million sqft property at One Yonge. 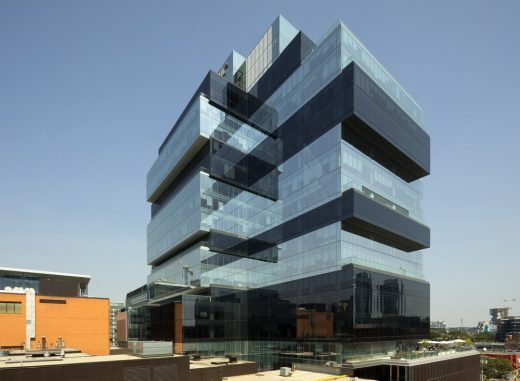 The design was led by Micheal De Cotiis, President and CEO of Pinnacle International and David Ponatrini, Founding Principal of HPA, who consider this project a successful demonstration of collaboration between the City, Waterfront Toronto, Developer, and Architect. 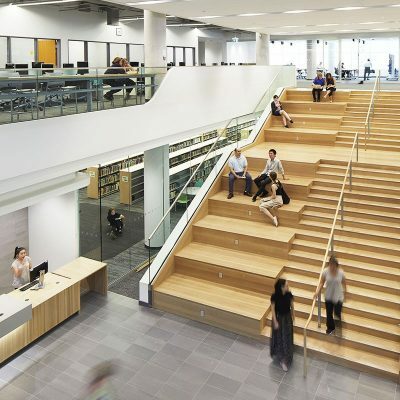 Canada’s largest academic library is growing. 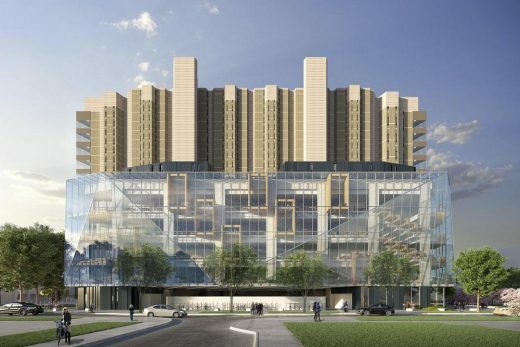 A major expansion of Robarts Library at the University of Toronto will add 1,200 work and study spaces to the iconic facility, which is known as an exemplar of the concrete Brutalist style of architecture from the 1960s. [Misfit]fit is a new six-storey, 32,000 square foot boutique office building situated on a small vacant site in Toronto’s Liberty Village. Seeking to build upon the rich lineage of Toronto’s precast concrete history, the proposal provides an alternative to the pervasive glass curtain wall project. 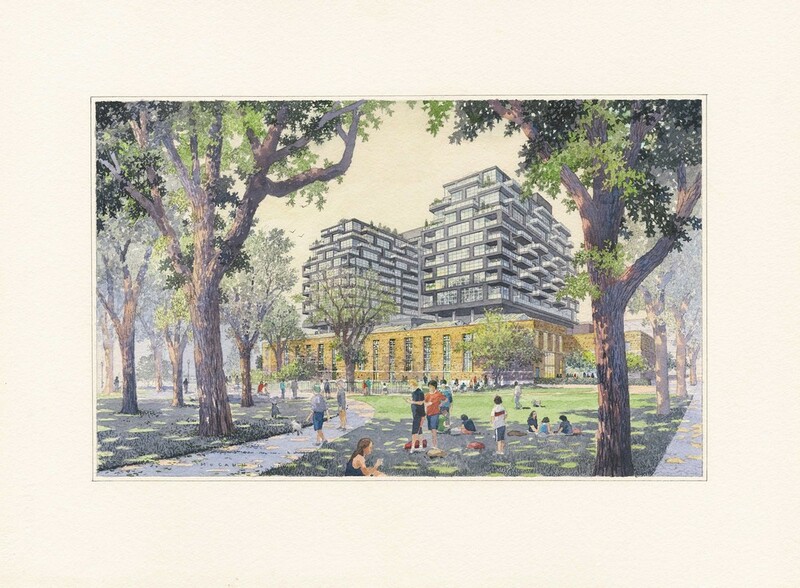 A large heritage building on an historic downtown Toronto site will be preserved and adapted from its industrial origins to become a vibrant mixed-use community hub for a rapidly growing residential population. The public art exhibition will welcome 6 new lifeguard stands to Balmy, Kew and Ashbridges Bay beaches in Toronto’s east end, situated south of Queen Street East and between Woodbine and Victoria Park. 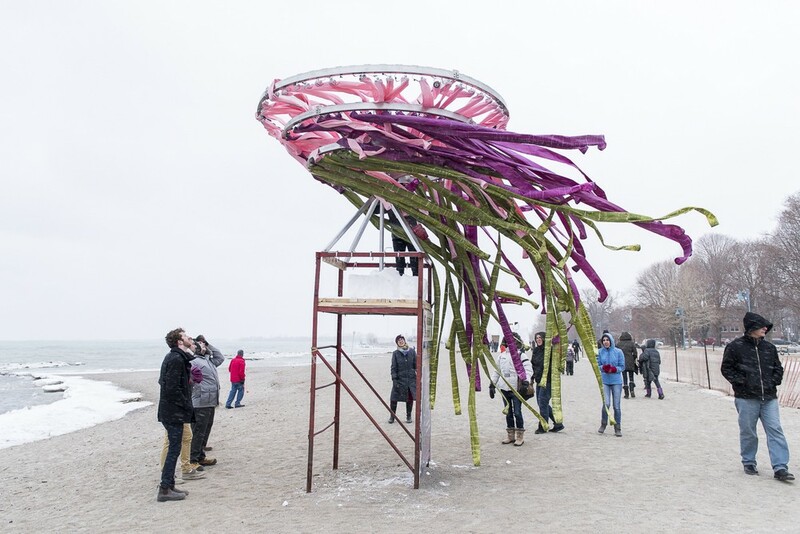 These lifeguard stations will serve as the armature for the temporary installations. Three new tower buildings for Toronto’s downtown arts and entertainment district by one of the most celebrated architects in the world. 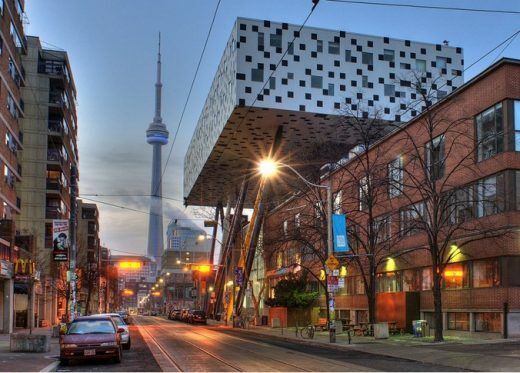 OCAD University is Canada’s largest art, design and new media university. Following a remarkable contribution of $27 million from the Government Ontario through the Ministry of Training, Colleges and Universities, the university is realizing its goal of transformation.